Over 65 per cent voters cast their ballot in the second phase of the Uttar Pradesh assembly elections across 67 seats on Wednesday while Uttarakhand posted a record 68 per cent turnout. Over 65 per cent voters cast their ballot in the second phase of the Uttar Pradesh assembly elections across 67 seats on Wednesday while Uttarakhand posted a record 68 per cent turnout, the Election Commission said here. Voting in the assembly elections to two states remained peaceful, officials said. 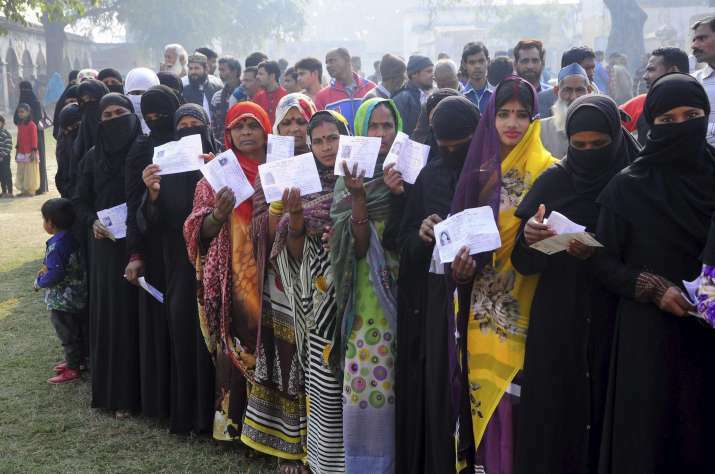 The Election Commission said the "very sensitive" second phase of polling in 67 assembly seats in Uttar Pradesh passed off peacefully and overall mood made it appear like a "festival of democracy". Over 68 per cent votes were cast in Uttarakhand, two per cent more than the last assembly polls. Polling in 69 of the 70 constituencies in the hill state ended on a peaceful note, Election Commission officials said. Polling for Karnaprayag constituency has been deferred following the accidental death of BSP nominee. Of the main constituencies, Nainital registered 70 per cent, Haridwar 70 per cent, Uttarkashi 73 and Udhamnghnagar 70 percentage. This is the fourth assembly polls in the state where 7.5 million voters decided the fate of 628 candidates. In UP, the seats where voting was held were spread over Bijnor, Saharanpur, Moradabad, Sambhal, Rampur, Bareilly, Amroha, Pilibhit, Kheri, Shahjahanpur and Badaun districts. "The polling was 65.5 per cent till 5 p.m. and was continuing," Vijay Dev, Deputy Election Commissioner in charge of Uttar Pradesh, told reporters here. Officials in Lucknow said that maximum voting was reported from Saharanpur and Lakhimpur Kheri. Of the 67 seats at stake, the ruling Samajwadi Party had won 34 seats in the 2012 polls, followed by BSP 18, BJP 10, Congress three and others two. In the present phase, 721 candidates, including 62 women are in the fray. The maximum candidates (22) are from Barhapur (Bijnor) and a minimum of four nominees from Dhanaura (Amroha). The prominent contestants include controversial SP minister Azam Khan and his son Abdullah Azam, who are contesting from Rampur and Swar seats respectively, Saif Ali Naqvi, son of former Congress MP Zafar Ali Naqvi, former central minister Jitin Prasada from Tilhar (Shahjahanpur), BJP Legislature Party leader Suresh Kumar Khanna from Shahjahanpur city and state minister Mehboob Ali from Amroha. In Uttarakhand, Election Office sources over 68 per cent of the electorate cast their votes by 5 pm but many people were still standing in the queues outside the booths, implying that the poll percentage may go up by the time the final figures are collated. An EC spokesman said in New Delhi it could go up to 70 per cent at the final count. For the first time, Voter-verified paper audit trail (VVPAT) machines were used in three constituencies including BHEL Ranipur, Dharampur and Rudrapur. In most of the seats, ruling Congress and BJP are locked in a straight contest. However, rebel candidates of both the parties are in the fray as independents in several seats and may upset the calculations of the official nominees of their respective parties. Among those testing their political luck are 12 former Congress MLAs who are in the fray as BJP candidates this time. They include Yashpal Arya (Bajpur), Harak Singh Rawat (Kotdwar), Shailarani Rawat (Kedarnath), Shailendra Mohan Singhal (Jaspur), Kunwar Pranav Singh Champion (Khanpur), Pradeep Batra (Roorkee) and Subodh Uniyal (Narendranagar). Haridwar (rural) and Kichcha in Udhamsingh Nagar district are two high profile seats to be watched out for as Chief Minister Harish Rawat is in fray from from both. Chaubattakhal is also an important seat from where former Union minister Satpal Maharaj is contesting on BJP ticket, besides Ranikhet from where state party president Ajay Bhatt is in the fray. Enforcement agencies seized Rs 16.52 crore cash, 3.29 lakh litres of liquor worth Rs 9 crore and drugs worth Rs 1.16 crore in Uttar Pradesh, while 1.5 lakh weapons were deposited. Vijay Dev told a press conference in the national capital that 117 electronic voting machines (EVMs) and 24 voter verifiable paper audit trail (VVPAT) machines had to be replaced during the polls. The corresponding figures were 20 and seven in case of Uttarakhand. There was one instance of paid news in Uttarakhand, EC said, adding that polling was free from any violence and largely uneventful. Deputy Election Commissioner in charge of Uttarakhand Sandeep Saxena said around Rs 3.38 crore cash and 147 illegal weapons were seized. Liquor worth Rs 3.1 crore and drugs valued at Rs 37.23 lakh were also impounded.